The Lowrance Elite 4 Gold is one of the latest additions to Lowrance’s Elite line of fish finders. Offering high performance and versatility at an affordable price, this compact device combines advanced fish finding features and GPS chart-plotting technology in one easy to use unit. It has an internal GPS antenna with high-definition mapping and is compatible with Fishing Hotspot and Navionics Gold for detailed cartographic reference. Thanks to the unique Hybrid Dual Imaging system, the Elite 4 Gold has the ability to support both DownScan Imaging and Broadband Sounder. 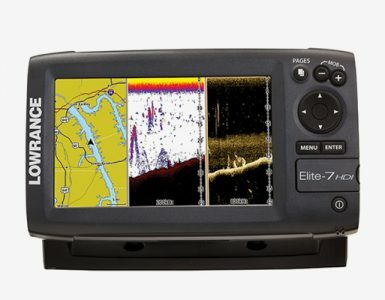 This model is also the first compact 4.3-inch display to present a 3-pane split screen view which shows the chart, DownScan Imaging, and Broadband Sounder simultaneously. The Lowrance Elite 4’s chartplotter capability is owed to its built-in precision GPS antenna and preloaded U.S. map that covers over 3,000 rivers, lakes, and coastal contours up to 1,000 feet in depth. Anglers may use a micro SD card to display Nautic Insight, Lake Insight, Jeppesen C-Map charts, HotMaps premium, and Fishing Hotspots Pro. The Gold bundle also comes with the Navionics Gold cartography that features major Canadian lakes, Great Lakes, and Canada/U.S. coasts. This device works with the latest Insight Genesis map creator that will let you create your very own hi-def contours and vegetation maps with recorded sonar data. Lowrance also included the TrackBack feature for reviewing the sonar history and spot fish locations with pinpoint accuracy. support both DownScan Imaging and Broad Sounder. Combining two powerful technologies, the conventional 2D sonar of the Lowrance Elite 4 has the ability to reach lower depths while the DownScan Imaging presents bottom and structure with an almost picturesque quality. Further detail can also be achieved through the Downscan Overlay that merges the grayscale down-image together with the broadband sounder’s color display. This results into the best possible view of what’s under the boat. Unlike its predecessor, the new Elite 4 Gold series has a larger 4.3-inch LED display to give users up to 36 percent more usable screen space and 70 percent more pixels. 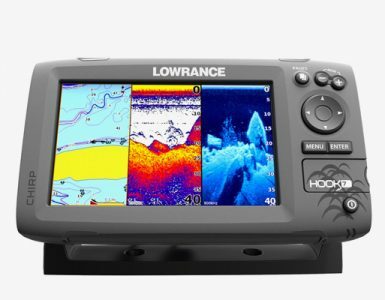 The folks behind Lowrance equipped the chartplotter/fishfinder with the Advanced Signal Processing system that will save you from manually adjusting the settings in order to see structure, fish, and other underwater details. There is also the new user-friendly page selector menu that provides instant access to essential features. Another welcome addition is the built-in temp sensor that constantly updates to help you locate where the fishes are. Plus, a Multi-Window Display is included for quick and easy page layout selection, complete with a 3-panel view with chart, DownScan Imaging, and Broadband Sounder. Enclosed in a durable ABS housing, the device is NMEA 0183 compatible for networking and is waterproof to IPX7 standards for withstanding total immersion. 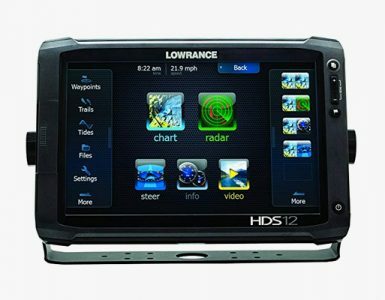 The Lowrance Elite 4 Gold HDI Chartplotter and Fish finder Combo measures 2.2 by 3.8 by 6.6 inches (D x W x H) and tips the scales at approximately 3.4 pounds. It comes complete with a high-capacity micro SD card slot, skimmer transducer, and tilt and swivel bracket. Lowrance has the Elite 4 Gold covered with a 1-year limited warranty on parts and service. This versatile fish finder offers a wide array of features that can really enhance your fishing trips. It is easy to use and the display is very clear to read, so you can quickly get a good image of the water below and around your boat. 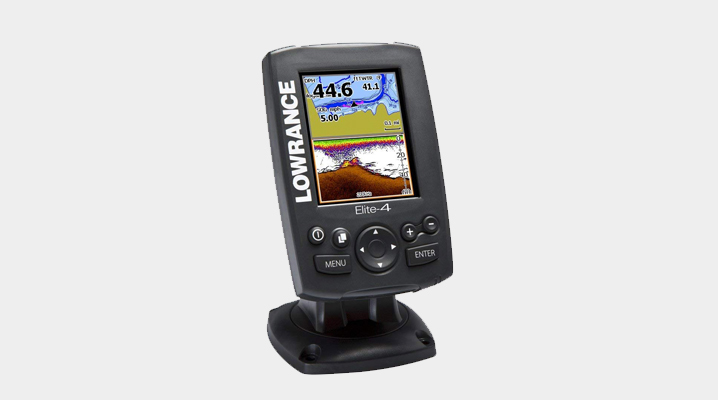 The Lowrance Elite 4 Gold is a good option for those looking for a reliable fish finder and is available at a very reasonable price.